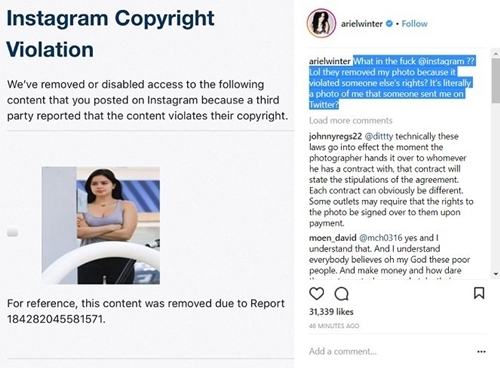 Instagram might keep taking this photo off of Ariel Winter‘s account, but she says she will keep reposting it every time it’s removed. The 20-year-old Modern Family actress received an “Instagram Copyright Violation” email after she posted the pic earlier this week. “What in the f–k @instagram?? Lol they removed my photo because it violated someone else’s rights? It’s literally a photo of me that someone sent me on Twitter?” Ariel captioned a pic of the takedown notice.